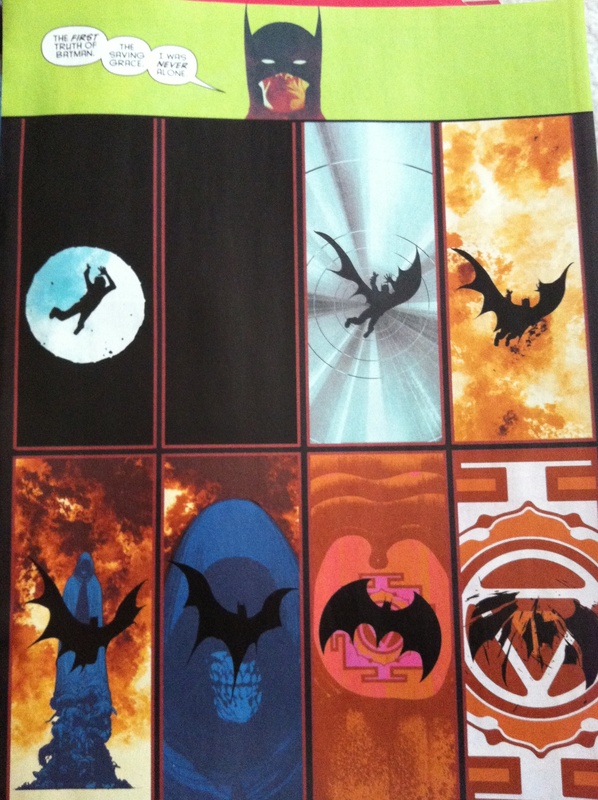 When the new 52 began, a lot of comic fans wondered what this meant for the future of Grant Morrison’s Batman Incorporated. One of the best ongoing DC titles when the new 52 was announced, Batman Inc. didn’t make it into the new 52 lineup until the second wave of titles – the wait was, without a doubt, worth it. 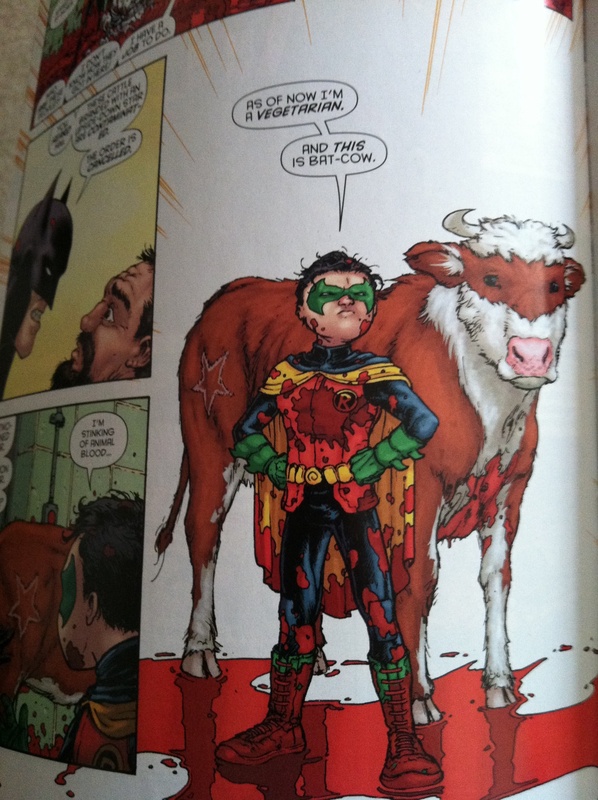 The irony with a new 52 Batman Inc., though, is the fact that Grant Morrison’s previous run on Batman is possibly the go-to example for a continuity-muddled quagmire (albeit an occasionally glorious one). I realize there were a lot of reasons DC recreated the heavens, but as a man who tried navigating the likes of Batman R.I.P, Batman and Robin, and The Resurrection of Ra’s Al Ghul, there were fewer convincing arguments for a fresh start than Morrison’s Skyrim-like depth. On top of that, the new 52 Batman Inc. is clearly, directly, unequivocally a continuation of Morrison’s pre-52 run on the series. If you haven’t read the 12 issues that comprise the first volume of Batman Incorporated, you’re going to be at least a little lost kicking off with the all-new #1 here. It’s not a personal slight, and I’m sure you’re a very bright young intellect, but it’s kind of an inevitability with a writer like Morrison. He doesn’t wait behind for stragglers. He warps them through a hyperbaric chrono-chamber and fries their mind like an egg. For example… Leviathan says what??? 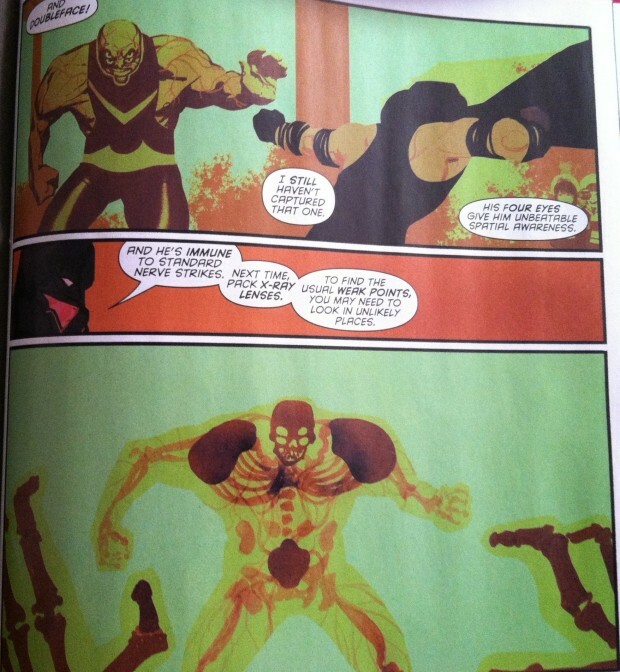 This is probably the single biggest knock on Batman Inc., the fact that it really doesn’t fit in as a part of the “new 52.” On one corner of the globe you have Scott Snyder crafting a brave new Gotham, and somehow within the same supposed sphere, Morrison is doing what he’s always done pre-52. The upside of all this is that Morrison’s Batman Inc. is fantastically fun – more fun, in fact, than any of the other Batman lines. Batman Inc. combines Morrison’s exponentially expansive imagination with a distinct and comical reverence for the campy Batman that is so furiously out of style in 2012. Doubleface: His 4 eyes give him unbeatable spatial awareness! None of the Batman lines can match Batman Inc. in terms of laughs, sheer unadulterated inventiveness, or excitement over the next character to enter the game. Apart from the sheer fun Morrison and Burnham are able to bring to a Bat-book, there is fortunately a deep and carefully crafted plot involving Leviathan, the sinister Global organization infiltrating society like a corrupt plague. In a way that is very similar to Snyder’s Court of Owls (Morrison’s Leviathan came first… I’m just sayin’), Batman becomes aware of an evil presence much, much larger than the usual Clayface-style individual baddy. Knowing he can’t handle something of this magnitude alone, Batman forms the Justice League Batman Inc.
I’d highly recommend you read Morrison’s Batman Inc. Volume One A) because it’s very enjoyable and B) because it will help you understand the characters and plot of these new 52 comics much better. You will be able to get by without that background knowledge, but characters like El Gaucho are expounded in much more detail in the first volume than it seems they’re going to be here. Same goes for Man of Bats, the Native American Batman of the people. For the most part, though, you can get by knowing the major players are Bruce Wayne and the Al Ghul’s (descedents of Ra’s, or in comic cinema terms, the dude from Taken or Schindler’s List depending on your age). Bruce’s condescending, beyond-possible-arrogant son, Damian, is his current Robin (he’s 11, but he’s trained by the best assassins in the world in all matters) and Talia Al Ghul, Bruce’s one-time lover and mother to Damian is pulling some strategic strings alongside Leviathan. There are a few sneaky funny moments peppered throughout the run so far, and Talia’s origin story told in issue #2 is convoluted comic history at its most elegant, but for my money the opening scene from issue #1 is the most memorable. And by memorable, I mean crazy, beyond-possible bloody. 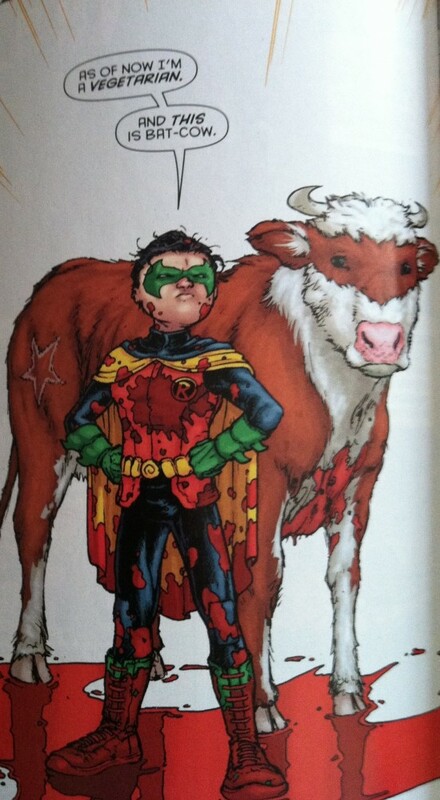 Add all that wild blood to the impossibly tough Damian taking a liking to a cow and you’ve got yourself an introductory fight scene for the ages. Chris Burnham deserves the lion’s share of the credit here for an action sequence that delivers everything you could want: Striking images, a breathless pace, and somehow an easy narrative to follow. Also, a new member of the Bat Family. 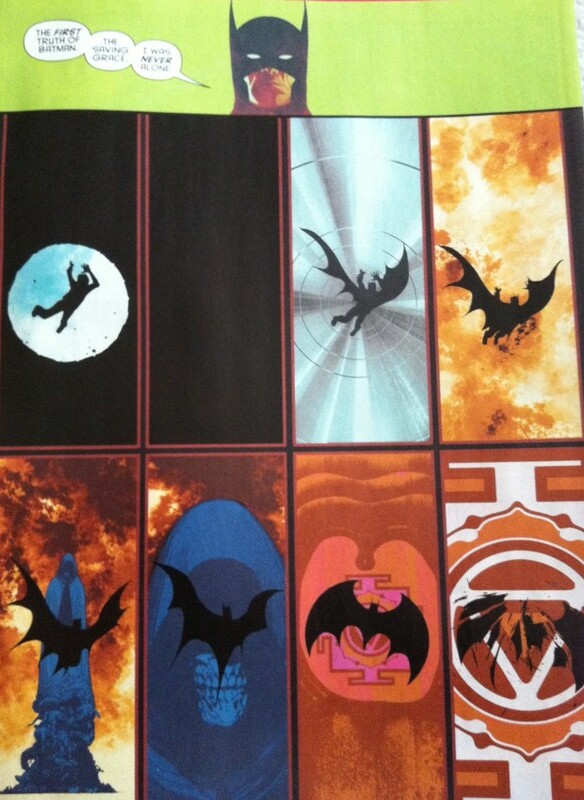 What Can We Gather From Batman Inc. #0? Unfortunately, not a whole lot. As origin issues go, Batman Inc. is one of the least plausible. I touched on this, but Morrison just laid the groundwork for this run last year, over the course of 12 comic books. You can purchase the full volume fairly easily and get caught up. Most Batman Inc. buyers have probably done this. More importantly, if you haven’t been keeping up with the Batman Inc. bat-story, and are looking for a way to catch up, issue #0 is not your answer. Where Talia’s story in issue #2 wove together years of Batman lore into one seamless narrative, Batman #0 gathers scattered fragments into the same zip code and lets you put them together. It’s a perfectly fine read, with some interestingly different art from Frazier Irving, but it does not advance Morrison’s plot. Mostly it’s just a reminder that Batman has taken his brand global and has a team of international “Bat-men” ready to take down the threat that is Leviathan. That minor annoyance out of the way, I’m excited for the reminder of this run as Morrison closes out Batman’s war with Leviathan. Morrison has already announced he will be leaving the title after issue #12, so it would seem we’re all but due for driven, targeted issues. Can’t waste time with a filler issue when you only have 8 left to tell the full story. To reiterate, if you’re looking to hop onboard for the conclusion, I’d recommend you read the full volume one instead of issue zero. At the very least take a look at the Wikipedia page. 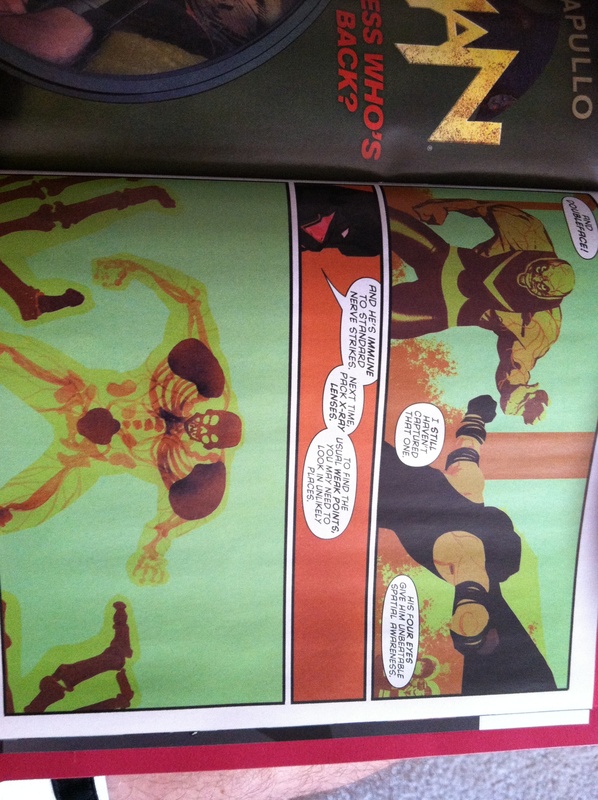 Morrison’s New 52 Batman Inc. is firmly rooted in the Old DC past.